From the Land of Shiny Things to the Land of Streaming Me, @stickyJesus by Toni Birdsong and Tami Heim isn't a book of theology or devotion or reflection, so don't expect that. Book and website are "a resource hub for social media outreach" and "an equipping hub for online outreach." Next of kin to world-changers such as Gutenberg Press in the 15th century and California Gold Rush during the mid-19th, the internet has changed the trajectory of history by creating a world so overflowing with connection, communication, [seeking after] community, and collaboration, it has become virtually flat (cf. The World is Flat 3.0 by Thomas Friedman). 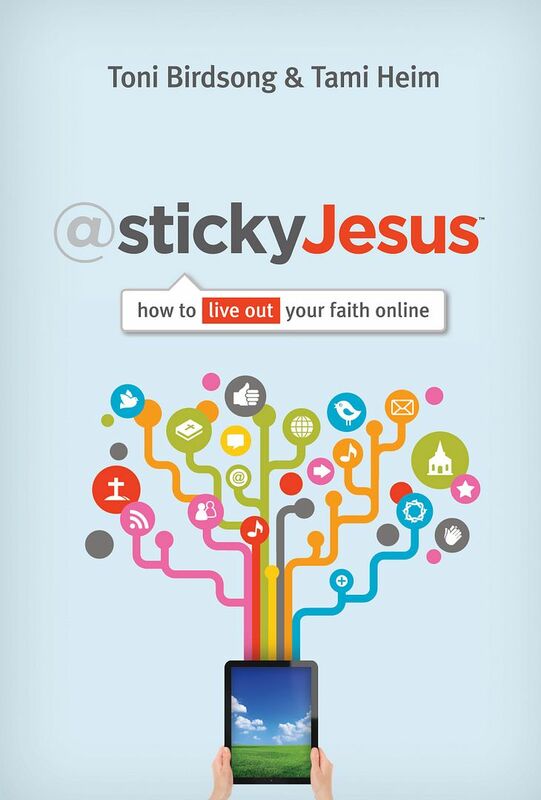 @stickyJesus isn't a theological or devotional book, and aside from the title and the focus of some content, it's not specifically Christian, but could serve as an outstanding resource for anyone who wants to be safe, effective, and protected in their online interactions in this era that's about Content Fever rather than Gold Fever. A "sticky" marketing ploy or concept stays put. "Sticky" immediately reminded me of Post-it notes that come in many sizes and styles and stay stuck where you put them until you remove them. Like almost every Christian, Tami and Toni consider the Good News of the Gospel of Jesus Christ the very "stickiest" event of all and return to that fact again and again. Communication is key in any relationship and in achieving any goal of any type and historically, crossroads and rivers have led to the exchange not only of goods and commodities, but supremely of ideas, languages and cultures. Earliest print and now electronic media have done the same: you can cite auction and retail portals and probably even more so, websites specializing in news and ideas that have shrunk - flattened - the world. In that case, what better way to disseminate and spread the Gospel than the internet's boundless electronic and human rivers of connection that criss-cross each other and where each comment and connection automatically multiplies almost exponentially? Regarding @stickyJesus' Christianity-related content, except for a single Roman Catholic and one Antiochian Orthodox (that I could count), most of the bloggers, facebookers and twitterers referenced are from relatively conservative churches that are "evangelical" in the current popular sense--as are Tami and Toni. I'm mentioning those facts because in the protestant mainline from which I hail and in which I basically still reside we have somewhat different ideas about mission and evangelism; those perspectives in turn affect our real-life and online interactions and content. The authors also persistently reference all members of the Trinity as "He" and are conservative on Pauline authorship. Just saying'... That having been said, virtually (yes!) all their advice applies well to anyone spending anytime on social networking sites or even sending emails. Strokes to the authors for never suggesting internet interactions as "virtual church" or as something in place of local church and community. I realize there has been some moving and thinking in those directions, but given that the gospel is a landed, grounded reality you can touch, see, taste, hear and smell, and given how central the physical sacraments and the gathered yet differentiated Body of Christ (speaking from my own confessional position) are to the existence of the church, true "virtual church" is an ontological impossibility. The book has 15 chapters or "files" full of cautions, explanations and excellent ideas for engaging others online and keeping your online presence and reputation clean. You learn a bit about the useful 4 Rs of Reviews, Ratings, Recommendations, and Rants. For social networking newbies files 11, 12, 13, and 14 "demystifying" Facebook, Twitter, blogging and content gathering together with how-to instructions and diagrams could be useful. Each chapter or "file" concludes with a useful download that provides a chapter summary and a suggested prayer upload. Stories and testimonies from people other than the book's authors are set in a smaller, non-serif font that's easy enough to read but conveys a sense of their being less important than the book's main content and I'd like to see that changed in later editions. We often feel captive to the Land of Shiny Things, but even in the Land of Shiny Things, "Light trumps shiny every time." [page 13] Tami Heim and Toni Birdsong have provided a guide for any thoughtful reader to bring The Light of Christ into all their spaces and places, real and/or virtual. Very well done!